Recently renovated , the Grand Hotel of St. John -to -Luz has kept its former wealth, coffered ceilings, marble inserts cabochon and its large wooden staircase. Take full advantage of your family holiday… Entertainment and fun guaranteed! Welcome to the Grand Hôtel Thalasso & Spa’s new boutique, located in front of the Reception Desk on the ground floor. The Grand Hôtel de Saint-Jean-de-Luz offers an ideal location to organize professional events or exclusive receptions. Ideally located at the foot of the Rhune and built around a gorgeous sheltered bay , Saint-Jean-de-Luz is the most beautiful seaside resort . The Loreamar Thalasso & Spa center uses seawater with acknowledged properties. A cozy space where our coaches offer a variety of entertainment, fitness or relaxation activities. Take your pick among our selection of spa treatments and sit back, relax and enjoy the moment. Un voyage à travers les secrets de beauté du monde entier. Le temps d’un soin, découvrez de nouvelles sensations et de nouveaux plaisirs. chic & light cuisine diet. Come taste our menus imaged and created especially by our chef. 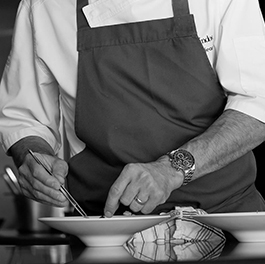 His gastronomic cuisine will enchant your taste buds. 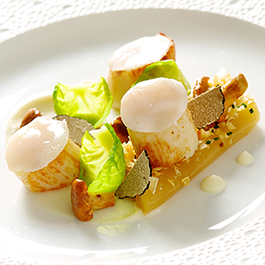 L’Océan’s “Detox cuisine” is a subtle blend of gourmet and healthy cooking. With the ocean before you, come by our new bar, “Le Clipper,” with its unique surroundings and friendly atmosphere. A unique place, a clear, bright and soothing atmosphere you welcome to our bistro "Badia" and our restaurant "l'Ocean"
Discover the Thalasso and the Spa of the Grand Hôtel in pictures. An exceptional table with delights for both the eyes and taste buds. Need to recharge your batteries, to banish stress or to lose weight? Adopt our Detox nutrition concept, long-lasting for your health and followed by our dietician. This organic gourmet cuisine, focused on vegetables and chasing fat and pesticides that could damage your organism, will bring you back to a natural and balanced nutrition. Poêlée de Saint Jacques aux salsifis braisés - Notre Chef vous dévoile l’une de ses recettes hivernales pour un plat léger et gourmand. Fraîcheur, simplicité et raffinement ! Le chef des cuisines du Grand Hôtel, vous invite à découvrir une cuisine française de terroir inspirée par la mer et les traditions basques. Succombez aux saveurs de nos deux restaurants ! Download our “Treatment Guide” to find out more about our packages and treatments. Discover our best special offers and guaranteed best prices by booking online. Find the perfect gift box among our exceptional selection. Giving a gift is also a treat.